Jasmine improvises because it’s the only time she actually believes that doing something stupid is better than not doing anything at all. 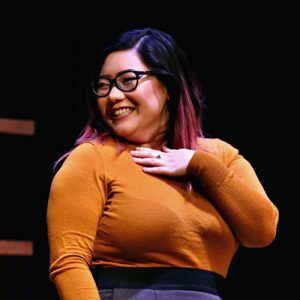 During the unfortunate undergrad semester when she was convinced she could double major and double minor, Jasmine took a Level 1 improv class at the University of Nevada, Reno as a theatre elective. She continued classes with Empire Improv, and ended up performing with a Harold team until she broke every bone in her ankle in a freak car accident. After healing, she ended up on a longform troupe called Mediocre Tongue Work. She misses them dearly even though she was the one who decided to move or whatever. Jasmine took a Level 5 class at WIT in her first few months of living in DC, and the rest is history or something. Jasmine is currently a master’s candidate in Arts Management at American University and works as an associate consultant for nonprofits. She’s also been a preschool teacher, a theatre camp instructor, a blackjack dealer, and some other things that have nothing to do with her BA in biochemistry oops. She moved to DC by trading in all of her airline miles for a first class ticket for herself and her cat, GG.